Dispatching is a key element in DSM. Deciding who can do which job and when is a difficult process. DSM will help by keeping worker information on hand and adding up the estimated hours of work. At any point in time you know exactly how much work there is and which workers are available. 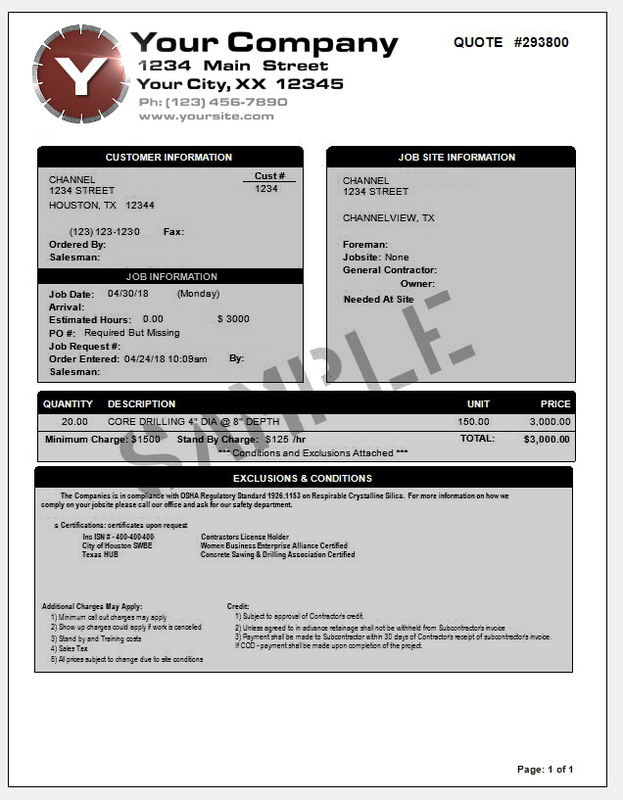 When you go to specify an operator to do a job, a filtered list of only qualified employees is presented. Along with the name, the skill level, number of jobs scheduled thus far, and total estimated hours of those jobs are shown. So you will be able to find the right person for the job quickly. DSM also makes it easy to swap operators when needed. You will be able to squeeze in those extra jobs you weren’t able to before and become more profitable. Simply put, DSM boosts productivity by making it easy to schedule and get more done through efficiency. Since customer billing and accounts receivable are usually done within DSM, the system knows the customer account balances. Therefore, it can warn you before someone enters a job for a company that is way overdue. If you allow access, dispatch can quickly access account information and view the invoices that are outstanding. 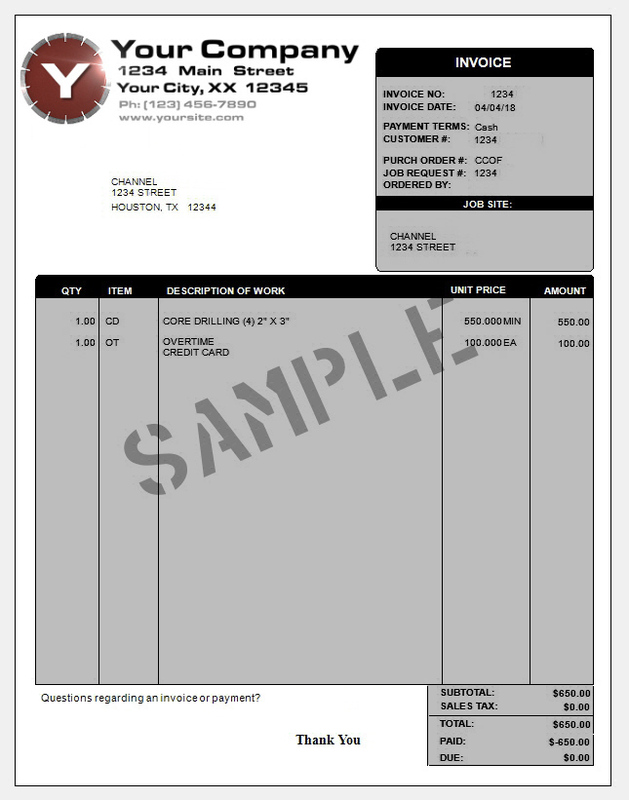 You may also print copies of the invoices, fax, or email your customers a statement. 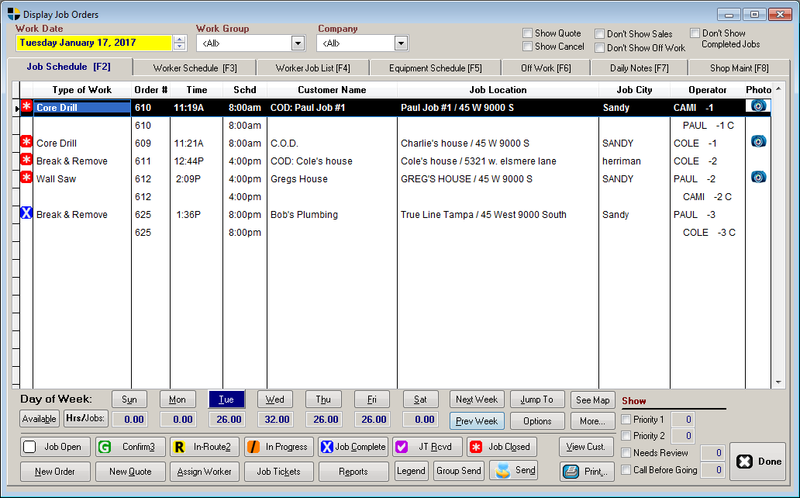 When you use an automated system like DSM, viewing the customer’s order history is a snap, providing you with a list of all the quotes and jobs, along with all the details in regards to the specific quote or job. By using DSM, it becomes much easier to stay on track when everything is compiled and viewed through the DSM system. Cash management is always important. So DSM helps you to manage your customer’s unpaid invoices. While DSM generates monthly statements, these letters pick up where the others left off. 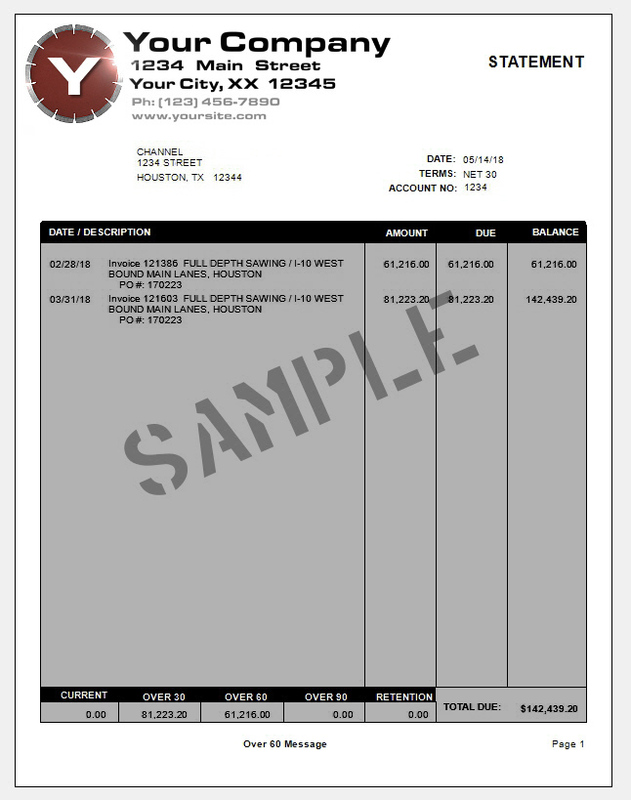 The collection letter screen provides a list for unpaid invoices over a set threshold. Simply select the customer to create the collection letter. If payment is not received after the first letter is sent, a second letter, and later a final demand letter can be produced. This system digitizes the process that so many companies manage by hand. It reduces the time to manage aging reports and collection letters from days to less than an hour and reduces burdensome calling time. Like most companies, you have an enormous investment in trucks, saws, compressors, generators, etc. Keeping track of your trucks and equipment is important. DSM provides you tools to keep track of basic information on these items, giving you a simple way to keep inventory and know where it is located by assigning it to a truck and operator. Giving you a way to track the service history for your trucks and equipment and specify when the next service completed. This gives you a way to be sure your equipment is well maintained. 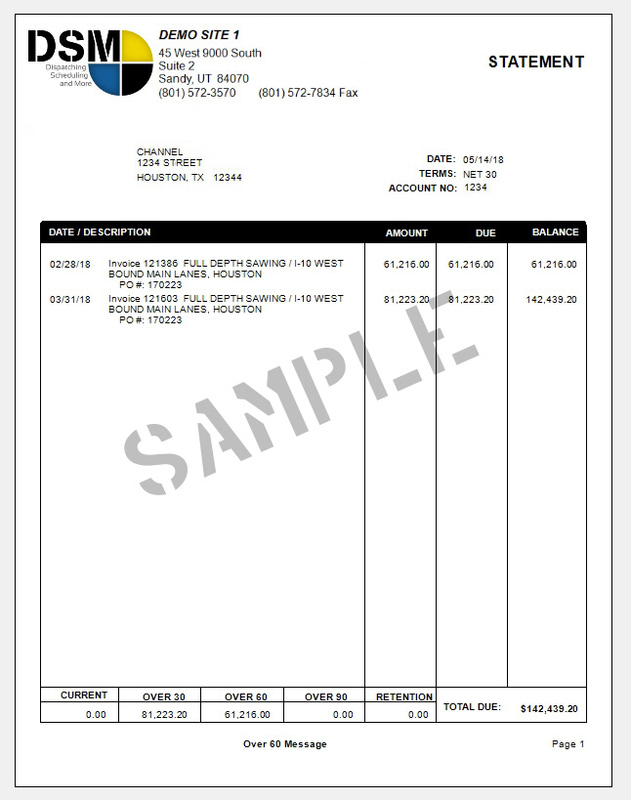 DSM provides reports about your inventory, including the maintenance and repair cost totals for each piece of equipment and when upcoming service for equipment is due. If you choose to create service records, DSM actually creates and produces service order tickets suitable to be given to your mechanics. Once completed, the details are entered into DSM accordingly. 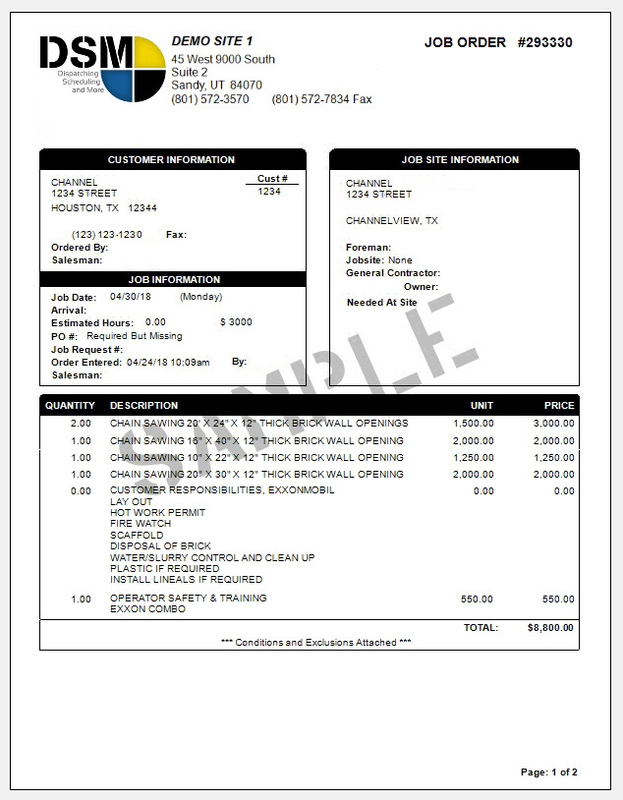 Service records contain the details of repair and maintenance work done in your shop. If the work is taken out of shop, use the outside vendor field. You enter the labor/hours worked, a shop rate, any parts you used and any outside vendor cost. DSM totals these numbers for you to track the total cost. To simplify the system, the service record processing is identical for trucks and equipment. 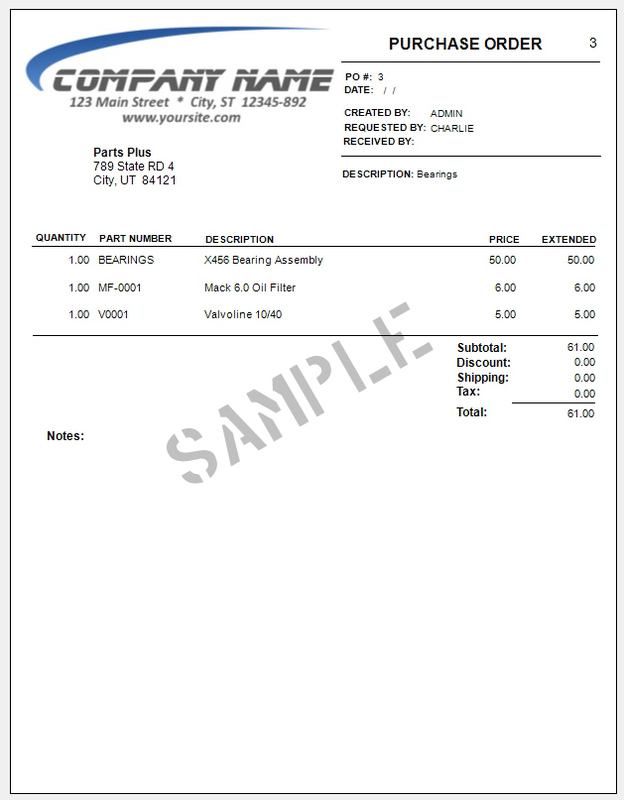 The system can even track part usage and automate the reorder process for commonly used parts. 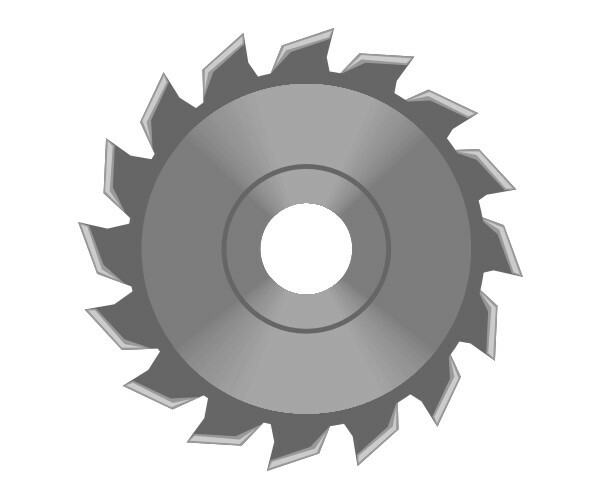 Diamond blades are an essential tool and are typically a major expense item. Improper use, poor selection, or inconsistent quality can impact your bottom line. DSM makes it easy and convenient to track blade footage. DSM logs the blade information including make, spec, cost, type, size, and which worker has it. 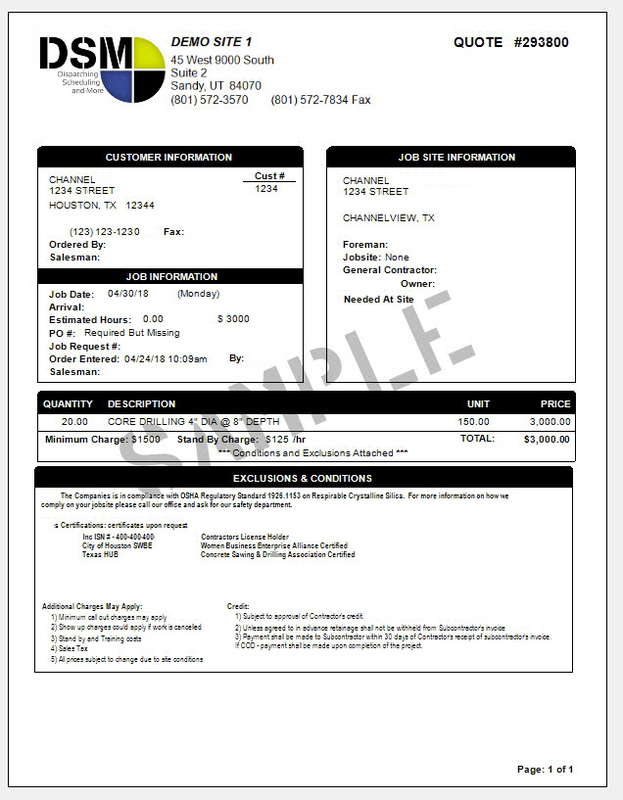 Footage is entered at the job ticket level easily, quickly and efficiently. With minimal effort, you can have accurate footage logs to leverage your diamond purchasing. This alone can save you thousands per year. After the job is done, enter the job ticket information into DSM (DSM automatically tracks missing job tickets). 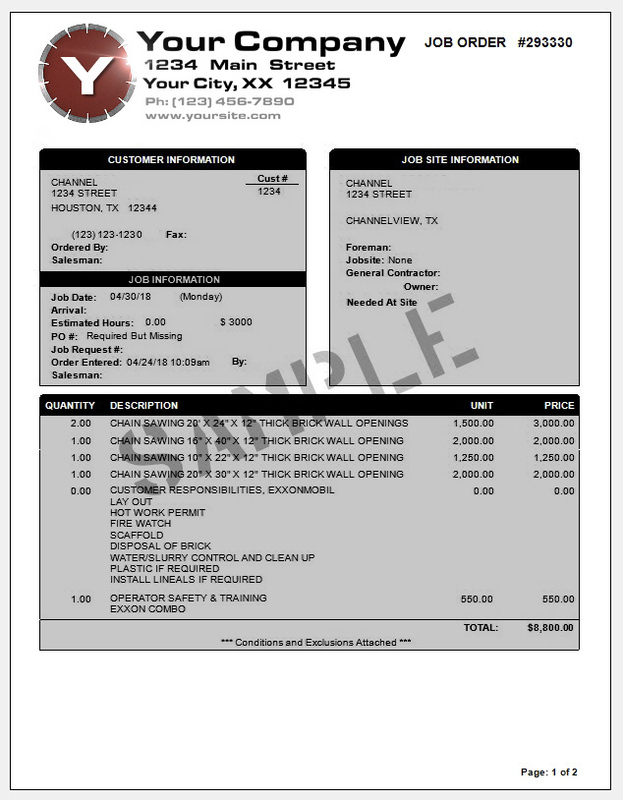 DSM will help your business create and generate your invoices (what you will bill on the invoice), diamond blade usage (which blades you used and what the footage was) and worker time card information (who worked on the job and how long did it take). 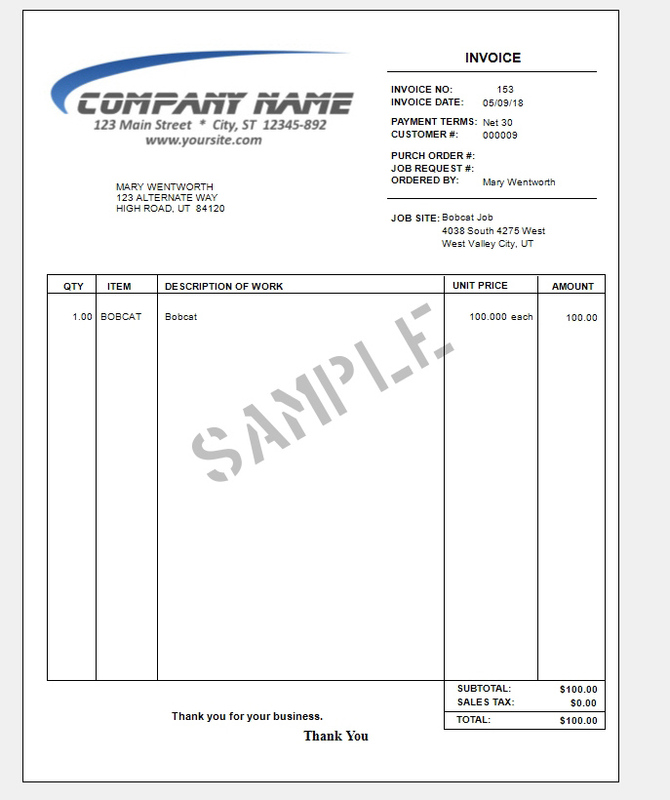 These three items create the invoice: timekeeping, blade wear analysis, and hourly revenue reports by man, work type, job costing, and more. Enter the data once and it flows through the system and generates the information you are looking for. 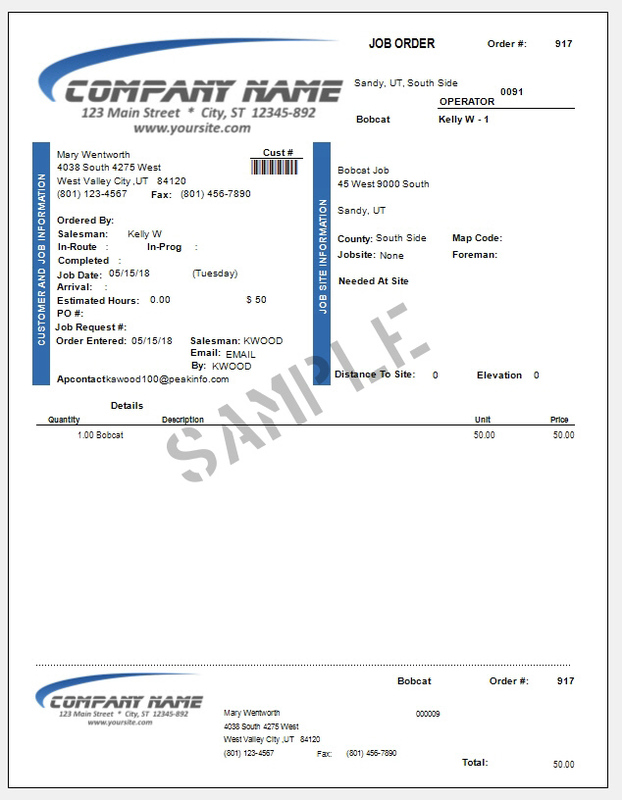 Purchase orders allow you to control costs. 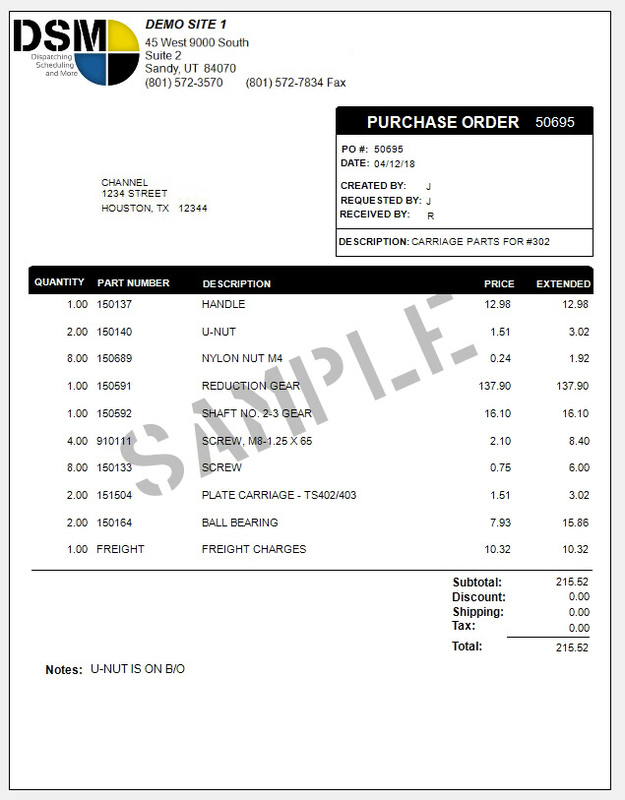 DSM provides a simple, yet powerful system for tracking orders and receipt of goods. 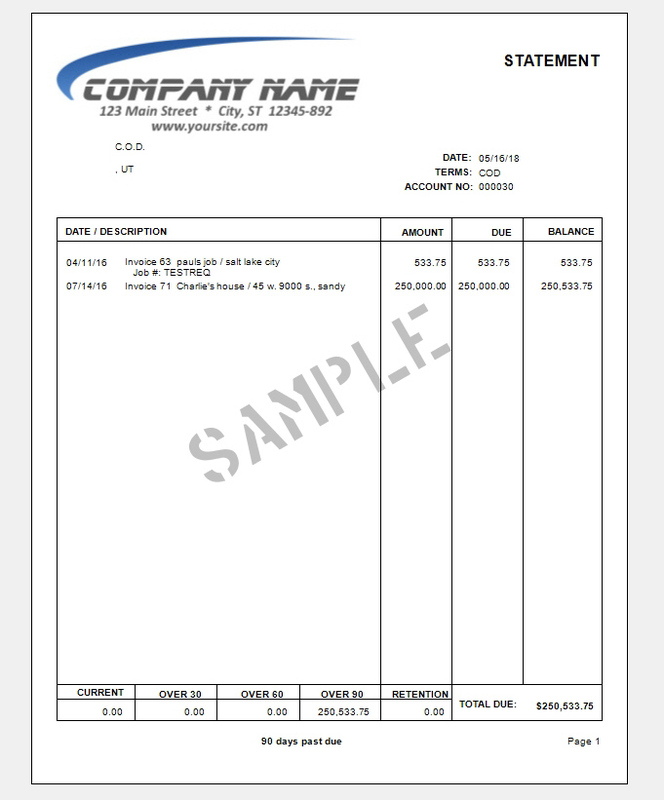 With the purchase order system, it is easy to compare the price quoted to the price on the invoice. You also know how much you’ve already ordered to avoid potential cash flow crunches. 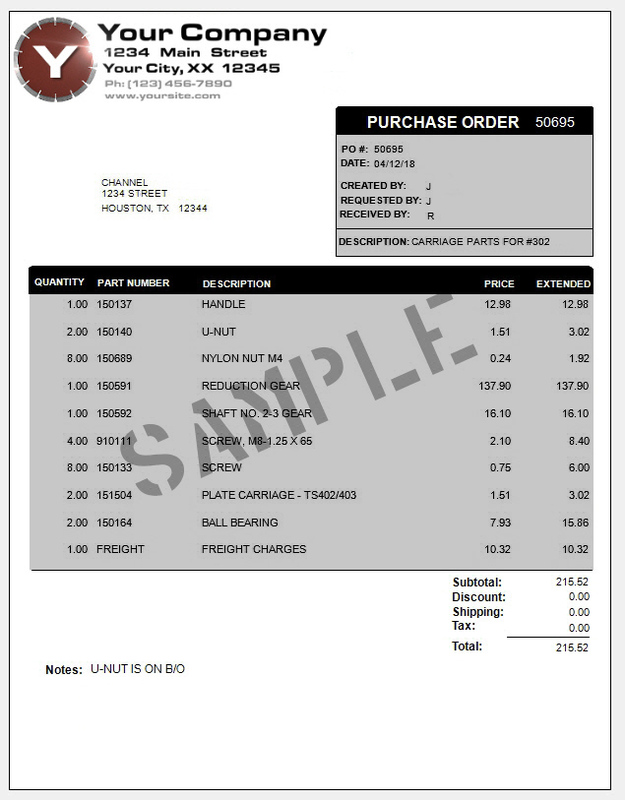 Reorder points on both diamond blades and shop parts can be set, making it easy to place orders. 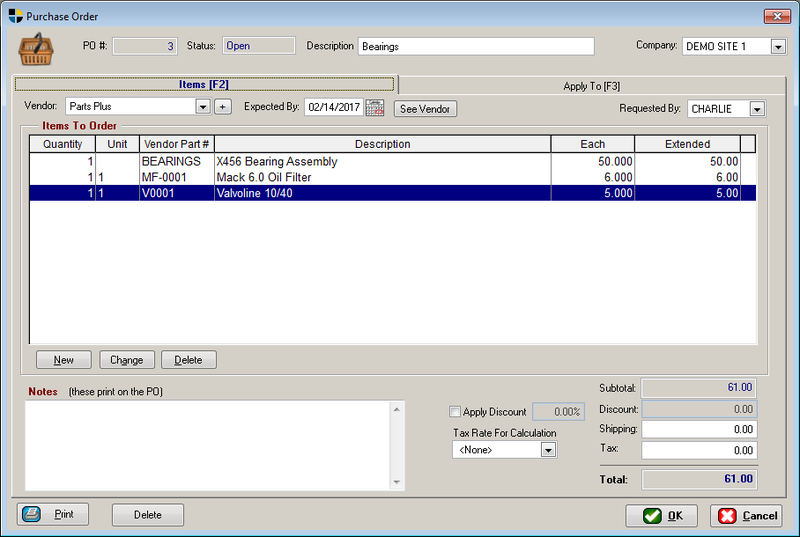 A blade & part reorder screen allows you to build PO’s in seconds. DSM gives your business the ability to accomplish more in the same amount of time. DSM provides you the ability to generate and store quotes, which are not yet jobs. 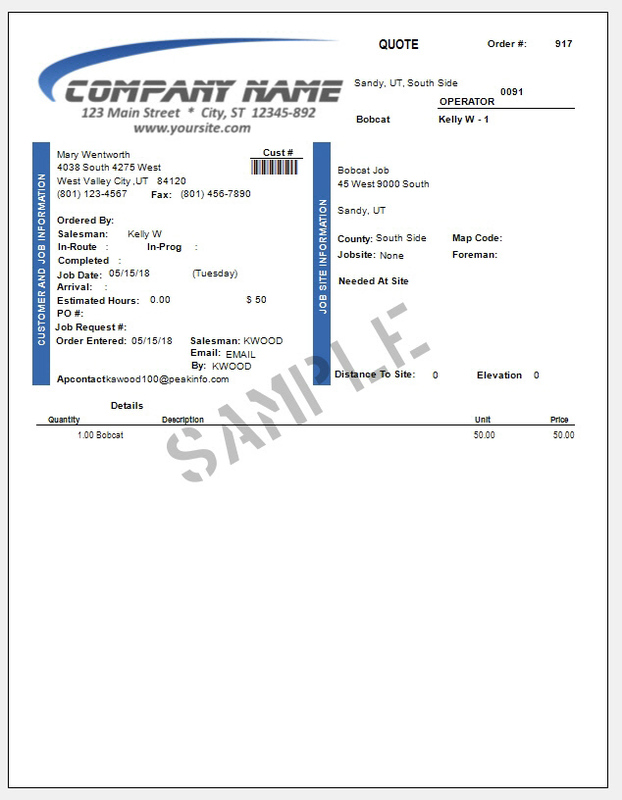 You may also print professional quotes that can be sent right from the DSM to your customers. Best of all you can recall them at any time, on any computer, in no time at all. DSM has the capabilities of using two methods to email. It can use the built in system, or can integrate with any MAPI compatible email client such as Microsoft® Outlook. DSM is known for its ability to help you manage your service business more efficiently, but now you can integrate QuickBooks® with DSM for the best of both worlds. The QuickBooks integration means no more manual entries from DSM into QuickBooks which will further increase productivity and eliminate data entry errors. DSM allows you to store any documentation and pictures related to a customer or specific job. Utilizing the DSM document manager is like having an electronic filing cabinet at your finger tips. DSM can produce both the weekly (WH-347) and monthly (CC-257) reports. The AIA billing system is a standardized method of construction percentage of completion contract billing ie. 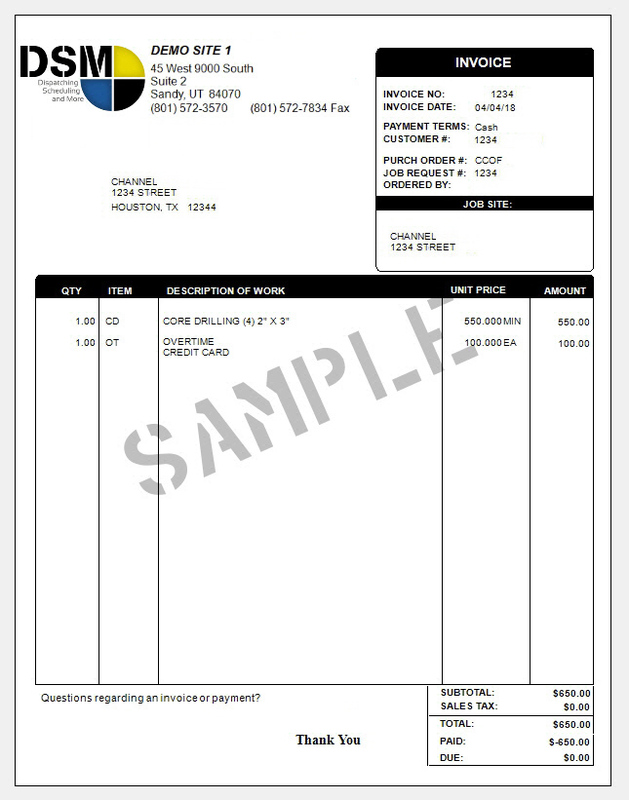 Progress Billing, developed by the American Institute of Architects. DSM has all of the following reports. The DSM Mobile app is a tool designed for field technician's smart phones, tablets and even PC's that will link real time information with DSM. The mobile app allows your operators real time access to their jobs. So instead of having to send the jobs, once assigned in DSM, the operator can retrieve them in a nice format with all the pertinent job details. But the real reason is that they can send information back to your office directly into DSM. Why Would I Want To Use The Mobile App? If your goal is simply to send jobs to your operators, you can do that natively within DSM via text messages or emailing. Its available now and the simplest solution. The DSM Mobile app uses an HTML web app. This means that it will work on Androids, IPhones, IPads, tablets and even on a workers home pc if they don't have a phone. You can typically book mark DSM Mobile to your homepage so it launches just like any app and there is no cumbersome app to download. The device itself is registered with DSM. The process is simple, a dispatcher authorizes a user to connect their device. Then the device and only that device is registered. They also have a password to login. Without first authorizing the device, other devices cannot connect, even if they have that user's password. You can withdraw connectivity just as easy from within DSM. Will It Work When There Is No Data Service? No, because it is an HTML based web application. The operator needs connectivity, however most areas today have at a minimum of 3G, which will work fine. If an operator does not have internet service, they simply need to enter their data when they regain service. The mobile app depends on tight connectivity with a web server which involves significant security configurations. For that reason, a customer is required to use the DSM Cloud by Peak Software to utilize the DSM Mobile app. DSM must be Cloud hosted at Peak Software's data center. That cost is $1500 annually or $750 per 6 months. 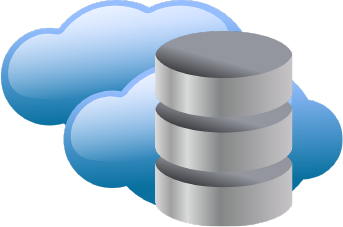 The Cloud hosting includes our OnGuard service which handles all the tedious backup work. Cloud hosting simplifies most customer's lives, however you must have reliable internet service at your office to be cloud hosted. If in doubt, we typically set up a test so you can see how it will perform. The mobile app is billed at $10 a month per unit, which is paid typically at your next renewal interval. You only pay for active units that login, so if you have 10 operators logging in during the busy season, it will cost you $100 per month during that time. If you drop down to 6 for the winter, it will automatically adjust to $60. Of course. The design of the mobile app allows us to set up a test simply and easily. Does It Do GPS Tracking? Phase II of the mobile app will do GPS tracking. Much of that work has already been done. It will incorporate installing a 3rd party app onto your phone. Downloading and installing that app costs approximately $8 per unit as a one-time fee. DSM's server will then pick up the data and provide you with complete truck tracking and total GPS integration. Adding this feature to DSM Mobile will add an additional $10 monthly fee, for a total of $20 per month per unit. If you have any questions or require additional information, please don't hesitate to contact us. 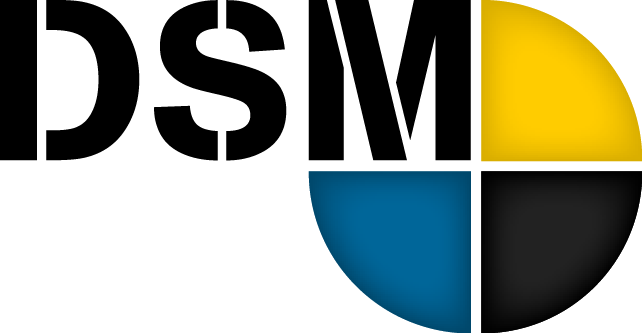 DSM simplifies backing up your valuable data to small compressed files for easy storage. More importantly it can monitor to make sure they are being done. If you use our Cloud Hosting service, all this tedious and but critical work is done for you each and every night. In addition to backups, DSM makes distributing updates easy. When a new version of the software is installed, a copy is sent to the server where all the clients will automatically download and run it. Although we accept emails and web support, we are fully staffed to answer your call and consider this our primary means of answering questions. Our friendly support technicians use state of the art remote control software if necessary to step you through any situation if a simple discussion is not enough. They are versed on all aspects of dispatch management. Because we know that your success is critical, the cost of support is included in our customer care. There are no extra fees to talk to a person. Ever. The forms in DSM are very customizable. Browse the simple galleries below to see the creative styles created by us. If you see something you like, our staff can help you create the perfect look for your business even matching perfectly any existing forms you are used to!